Step up into the stirrup. Sniff the wind. Feel the rhythm. Let the horse carry you. Ride along from the comfort of your computer. No previous horse experience necessary. Just an open heart and an expanding imagination. Enjoy! My horses ~ My art! My living, breathing, finely-sculpted, fluid-formed expression — a palpable, pulsing artform on four hooves. To me they symbolize something even grander and more elegant than the amazing beings that they are. My horses carry me into their realm. Into Nature and Freedom itself. 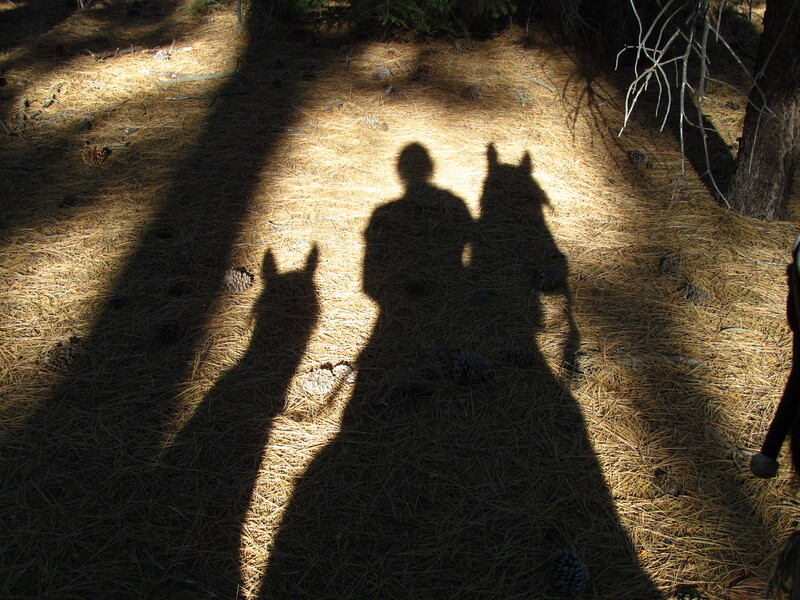 Together, we become part of a living painting, with changing light, shadows and shapes, back-dropped by trees and earth and scrub — all kept in constant motion by the ever-beating metronome of hooves and lungs and heart. 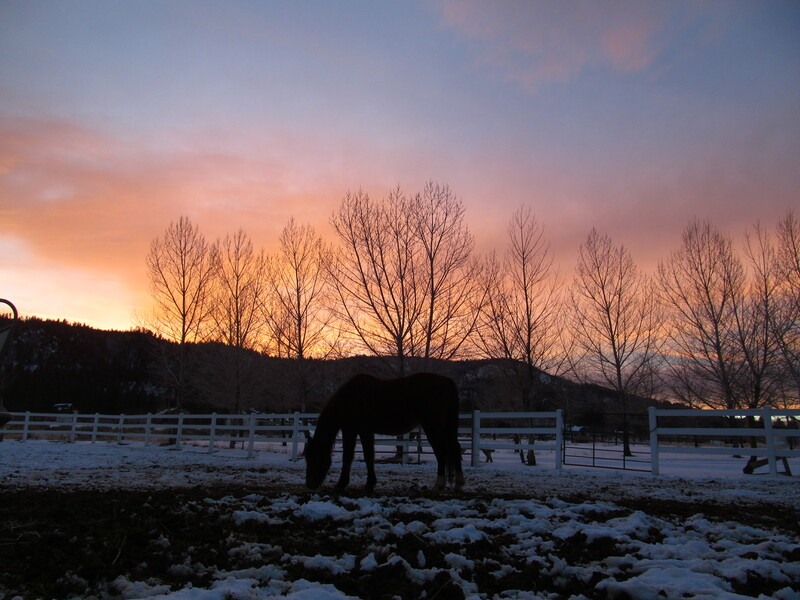 Like the famous works of the Masters, my horses free my passions and feed my soul. They take me higher, deeper — into a greater world than I would ever reach alone. As I watch my horses frolic in their pasture, I delight in how they move and respond one to another. Like a grand living organism, each seems to know his position in the herd and accept, or challenge it. From my vantagepoint, I observe the antics, the movements, the intentions played out in the acre-sized fenced framework before me. I interact with the art and the art interacts with me. My presence alone draws the horses to the fenceline, curious, creating both jealous displays of temper, as well as outright outbursts of fun. Apples tossed into the boundary cause a scurry of activity, each seeking a tidbit, oftentimes challenging a herdmate with ears pinned and hooves threatening. But soon, outstretched necks and gaping mouths chew contentedly, dropping frothy morsels from sticky-lipped muzzles. Ropes and halters lead them out of the field. Obsidian eyes, soft necks and tangled manes follow closely. Dusty dappled coats receive brushing, blankets, saddles . . .
My tack, my gear, another aspect. The lines, the shapes — pommels and cantles, stirrups and reins — curved leather cradles of tradition, function and fashion. 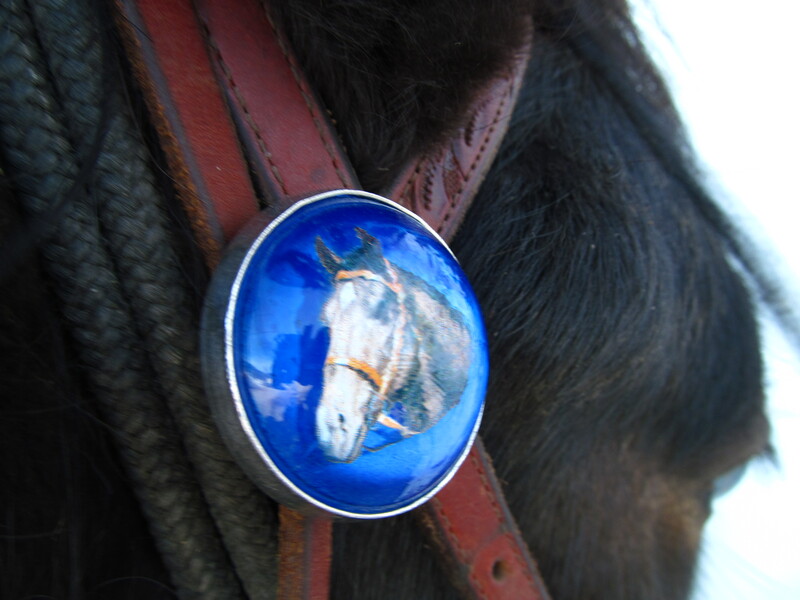 Colorful conchos. Riveting rosettes. Little details that make up the ambiance of the whole. Once in the saddle, my rides into the wilderness become my paintings. My masterpieces. And I paint them again and again. Each one unique. A ride never really repeats itself, even though the same horse, same trail. Each adventure offers a fresh approach, a new angle of light or arc of color. The result keeps me riding, ever renewed, in this life-affirming endeavor. I ride astride my horse, her dark mane pumping, flowing, as we float across the vast reaches, ears pricked forward, ready to greet the ever-unfolding scenery. I inhale the wildness of the place, adding to the intoxication, fragrant blossoms, vanilla perfumed pine, the earthy scent of amber leaves. Others from our herd gallop alongside with flaring nostrils, dancing hoofbeats and outstretched tails, painting a fast-flowing portrait of joyous abandon. Embracing freedom with every stride. My trails are my canvass. Texture and color, line and space, light and dark punctuate the endlessly pulsing pace. Like the sagebrush in the valley floor which greet my eye with rumpled heaps of widespread welcome. Once in the forest, gnarled-branched pinon pines become ghostly gatekeepers with brilliant lime-colored lichen “fringes”, their eerie moanings all but audible. Contained in the images of the forest blurring past are flashes from my childhood — the daydreams and horsey yearnings from monotonous schooldays past. Now, I live those dreams, I breathe them. I served my time back then so that I can ride my time now, and paint my present, my future, with horses. The outer reaches beckon. Up, up we plunge, forward into the landscape, into greater veils of wonder the farther we venture from home. Here the light shifts, takes on new meaning. Something calls us, drives us on. 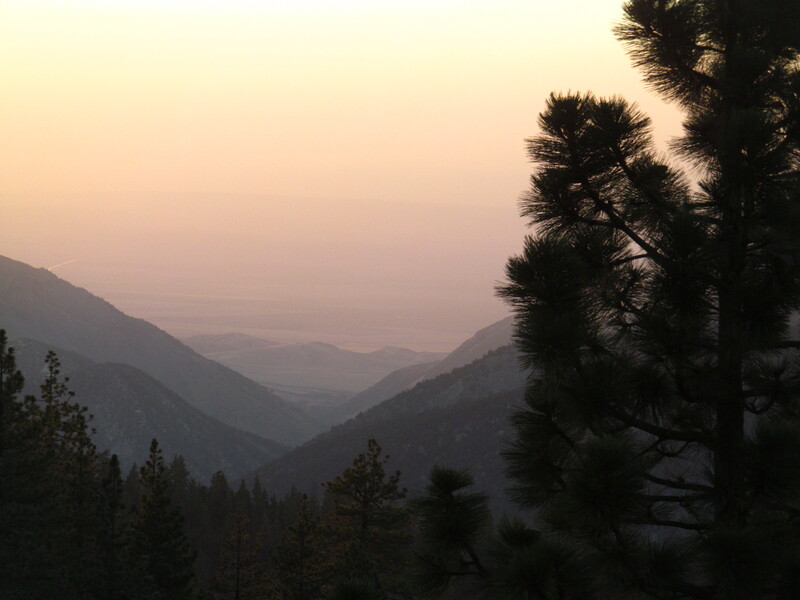 Up in elevation, to thinner air and vistas of grandeur. Past fatigue, past complaint, into the outer reaches of what we are capable of — for therein lie the prize portraits, the art nouveau, the renaissance of distant reaches afar. 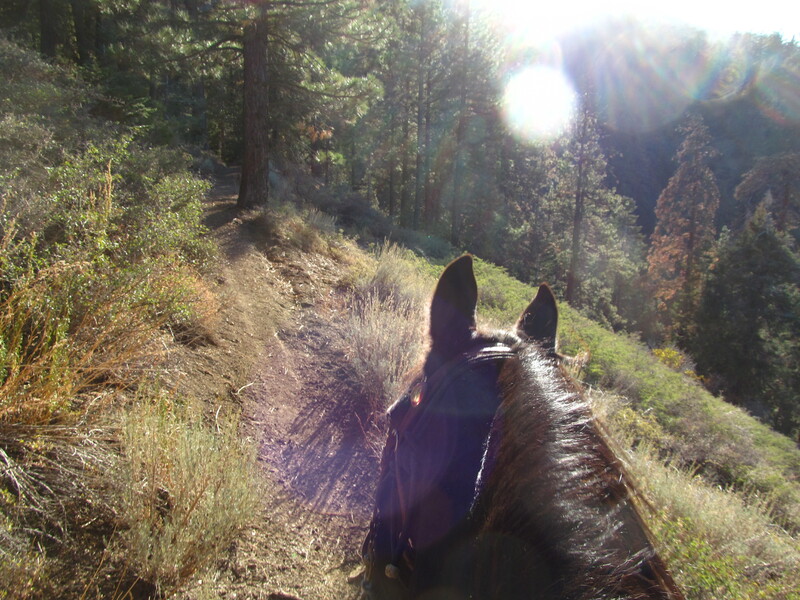 Come ride with me and my mare, Fae, on this Magical Mountain Adventure! Originally ridden/written July 2009. 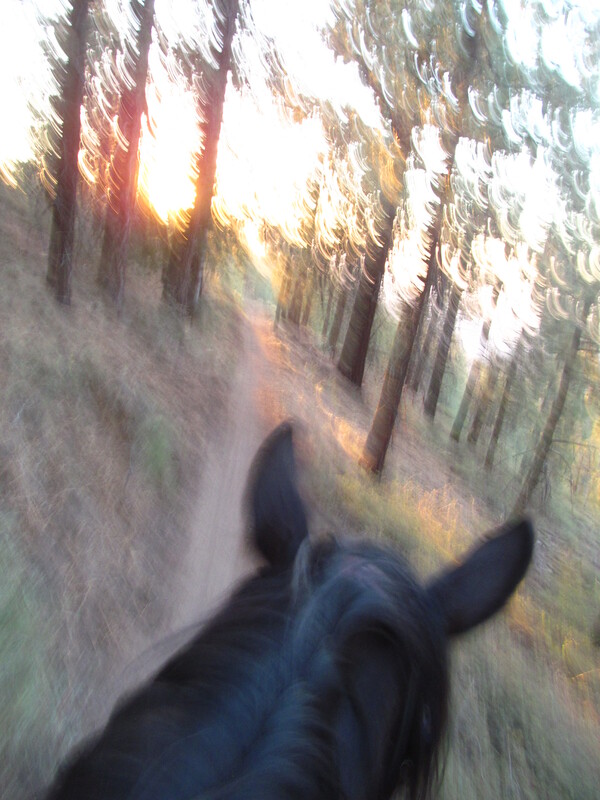 No camera that night; Rode Laddie – now 5 – up the same trail recently. Photos: July, 2013. 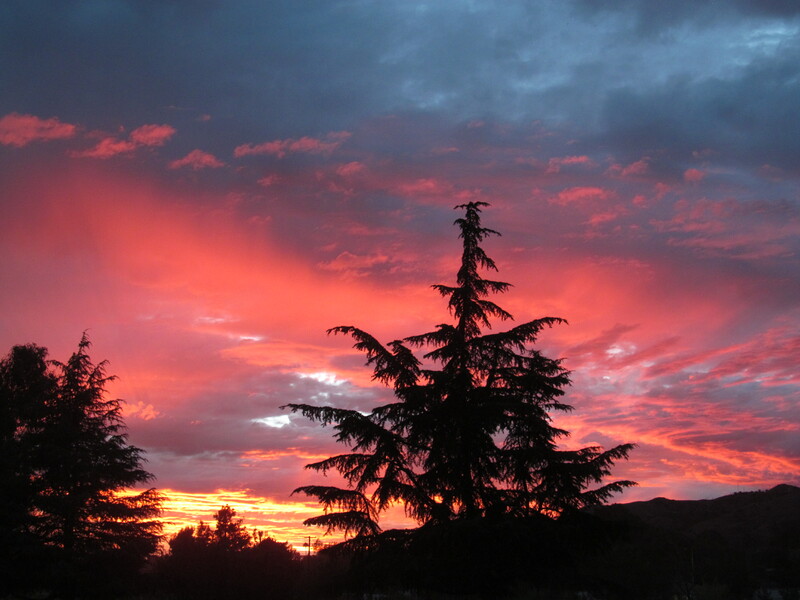 A burnt orange halo sets off the Western horizon, graced by a silhouetted treeline across a vast ravine. 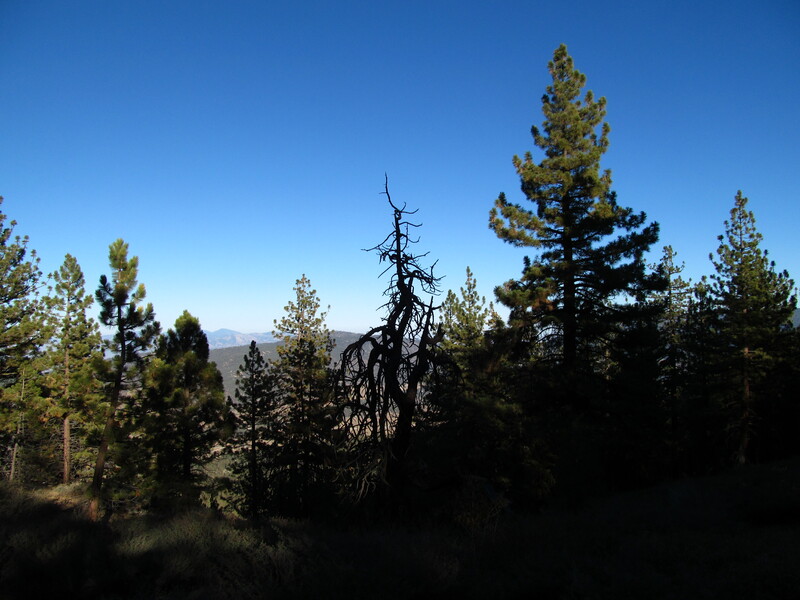 This ragged wilderness stands as it always has, some fifty miles inland from the Pacific Ocean, jutting to nearly 9,000’, separate from the farther inland ranges. 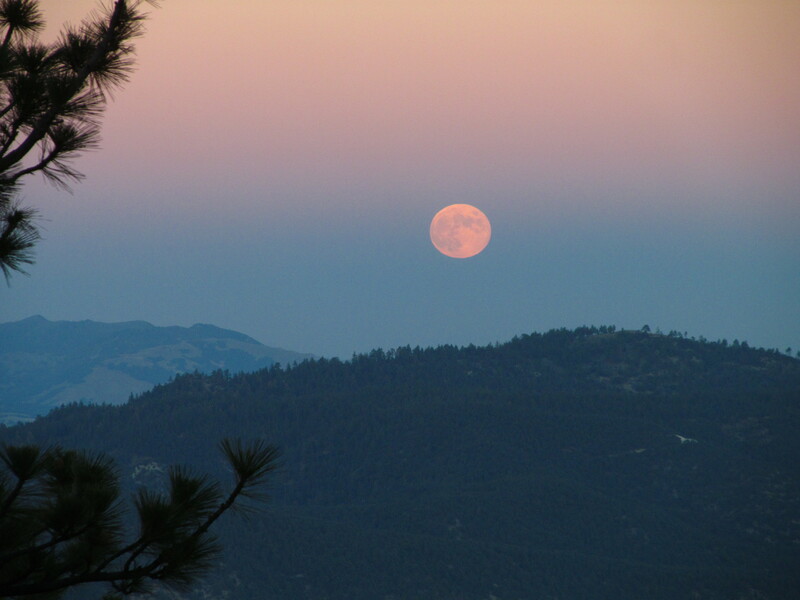 This, Mount Pinos (the television depiction of “Walton’s Mountain”) – my mountain-brother, my protector – defines the landscape here and holds at bay the far-off city lights. 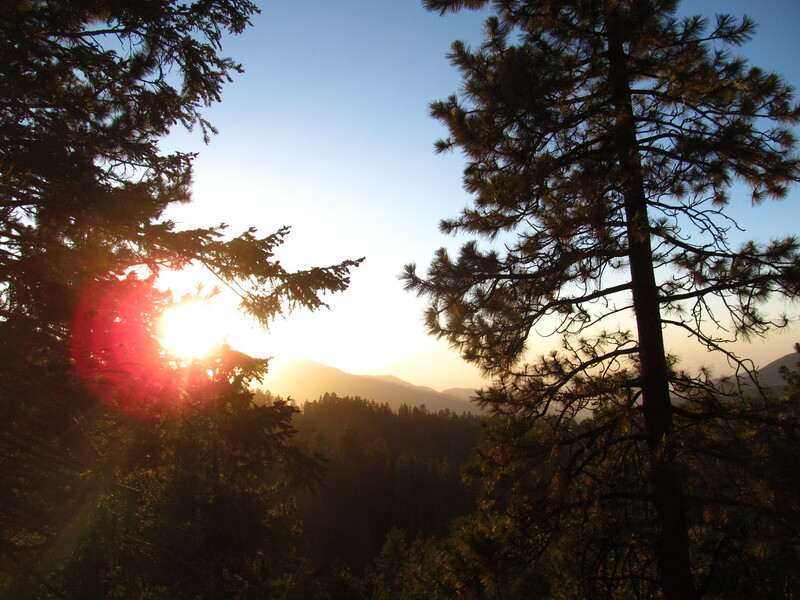 I moved here, years ago, from the coast, from Malibu, because of this forested mountain-brother – to be near him, sheltered by him. To ride and ski and hike his peaks and curves as long as my life allows. 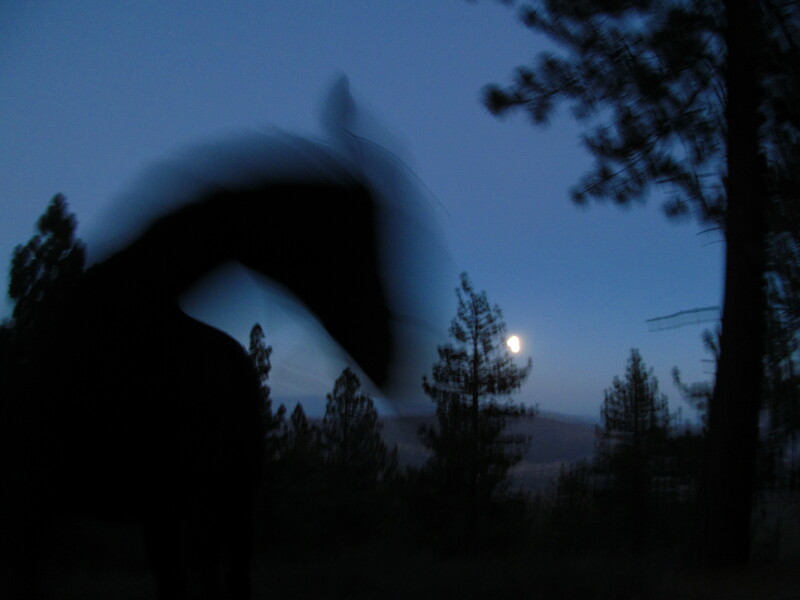 Although tonight is my first solo ride here on Fae, all our horses know this route, especially at nighttime. I’ve ridden this section for so many years, under so many circumstances, like a familiar road home. Here, the steep turn where Prize tried to flip over with me. Fae takes it well tonight, pivoting, and climbing the hairpin crimp. And here, the switchback where Sage got disoriented and turned around that night. 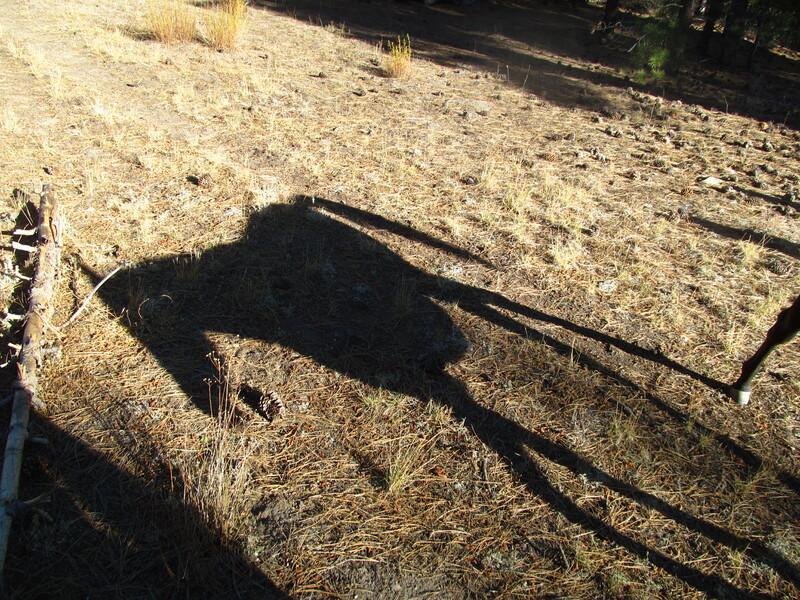 He followed us, loose and free, all the way up from Mill Canyon. But here we had to ride back to find him. I can still see him: dazed, walking alone, his gray coat shimmering white in the starlight – as if illuminated by a fairy’s torch. And I realize that my entire herd lives-on here. Both the horses we ride and love now, and the ones beyond the rainbow . . .
As if each ride leaves an ethereal record of our passing. Fanta and Starboy and Mentor are here. Lacey and Fauna and Angel. And Fae, little filly Fae, still follows mother Fanta, jumping the (now decomposing) fallen log in the meadow . . .
Their spirits linger, like those of the deer and birds and wildflowers that call this spot home. So I ride alone on Fae tonight—a maiden ride of sorts after her recent foals, Aria and Laddie, one year after the other. Fae, fresh back home, ready to polish and mature. And I remember Fae as a newborn filly in the simple days before 9/11. We had one week of bliss before the towers came down. How I appreciate that time now. In those early days, I can still feel them, I lay with baby Fae and held her, stretched out in Fanta’s shadow, breathing peacefully, oblivious to the changing world. I stroked her neck and whispered of the mountain adventures we’d surely have. How she’d carry me, and we’d soar, and all the wonderful rides we’d share. And here we are, all these years later, on the dark side of the mountain, fulfilling that dream! Fae surges strong beneath me. Fanta, she definitely pulled Fanta, my life-long Appaloosa mare – endless energy and springy gait. But Dallas the Shire (who is also her sire) is present here, as well. Big-stepping, big-framed, big-heart. Fae’s hooves clop the earth with draft-horse thud, yet her gait springs forward, willing. No need to prod her tonight, she flies into the darkness, ever up-ward, finding her way. Rounding the bend, we come into the moonlight now, illuminating the valley below. Directly below, the soft glow of several dozen Cuddy Valley lights – our home included – nestle, as if hanging from a hammock between the peaks. Surreal, almost Supernatural, the lights flare and dance – taunting in the distance, reassuring in the foreground – wagging an incriminating finger at those voyagers beyond their reach. As if their magnetism should have been sufficient to hold us, keep us in the safely lit confines of home. But we, broken free from their gravity, stare out in amazement, as if viewing our own galaxy from a spaceship, from afar. Past the lookout I stop, dismount – it must be ten o’clock – and I realize how rich I am. 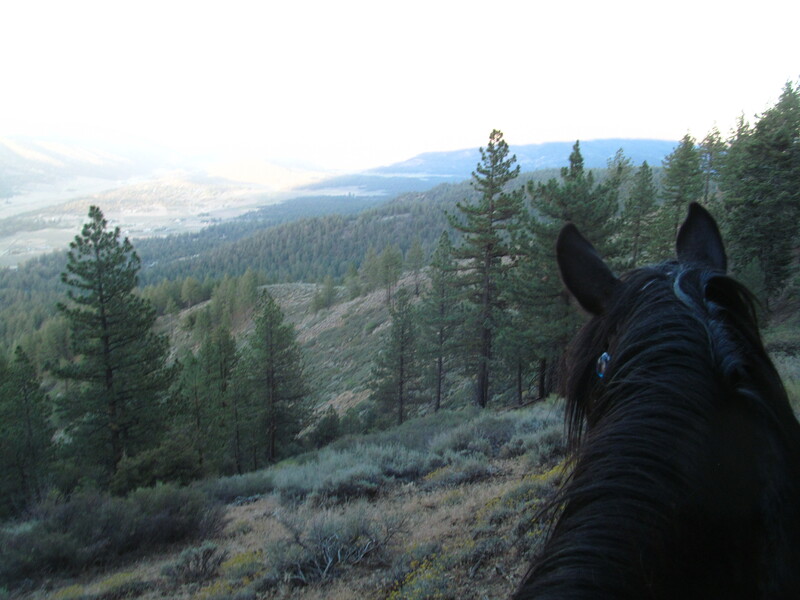 Who else would be, could, be up here, in the darkness, in the wilderness, riding her Mare without a care, and sitting here by the trail, feeling completely safe and at home? It’s a still night, not a breeze. So warm and beautiful. And I sit and lavish praises on lovely Fae, the outline of her large head darker than the shadows from the surrounding trees. And I marvel at my life. At the freedom. At the peace and beauty of these mountains – my mountains. Awaiting me, here, in the beginning of summer, ready for my repeated return. I look up into the sky, filled with stars, and I notice the airplane, from Bakersfield-way. I see the landing light. And I imagine the man or woman in the cockpit. How many times did I fly over these inky mountains, years ago, in my yuppie-business-pilot-youth? 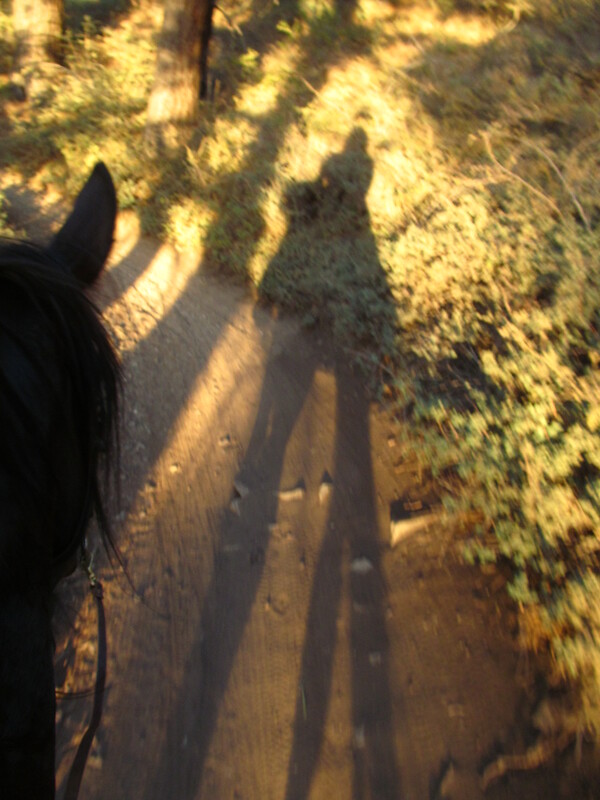 Not knowing that a woman below me, and her second-generation Mare, could be wishing me farewell? I watch, and listen until it’s no longer overhead. Until I’m no longer in the red-glowing cockpit of my long-ago plane, but rather, sitting by the trail again, holding the reins to my Mare. In the shadows, in the darkness. On the side of a 9,000’ Southern California peak . . . I mount up, we turn back, and head towards home. Magical moonbeams drape across the darkened landscape, illuminating spots and patches random, like an Appaloosa. And I ride my surefooted Shire-Appaloosa Mare, homeward. Richer, still, because of the Adventure. Fae’s my horse. Fae’s my dream! My life-long horse-dream come true! When I ride Fae, my home-bred half-Shire mare, now twelve years old, she’s perfect! Glassy, smooth gaits, willing mount, responding lightly to my every whim. But why is it that when certain other people ride my perfect mare, she responds poorly to them? What could be the difference between how I ride her, and how another rides? And Fae’s not alone. I see the same thing with Starboy. His walk completely influenced by the rider. When I ride him, he strides out. With another, “heavier” rider – not in weight but stiffness of movement – he lags and drags behind. Oy! 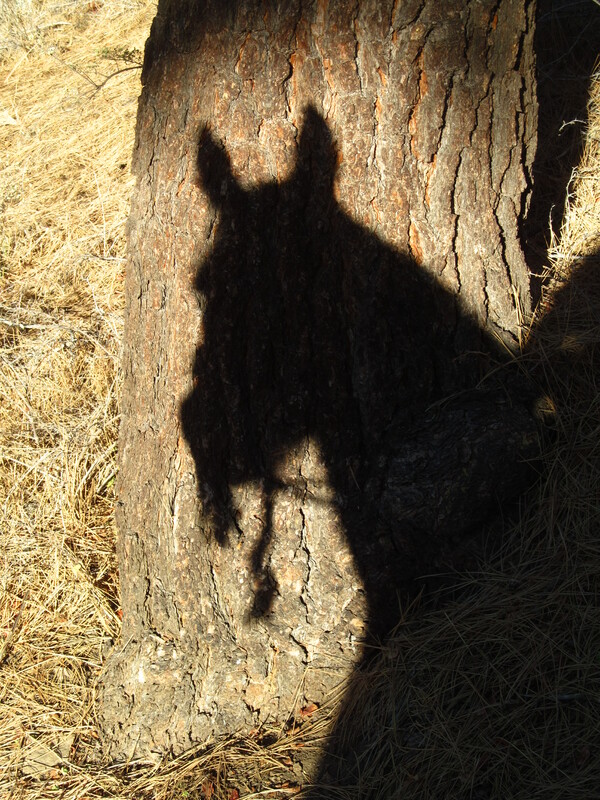 So I rode Fae into the wilderness tonight, free-flowing, strong, setting out to solve this mystery – paying attention not just to the jubilant experience of our swift endurance-style ride, but how was I able to get this out of her? What was my role in attaining her perfection? I’ve named the phenomenon: Finding (My Horse’s) Dream. 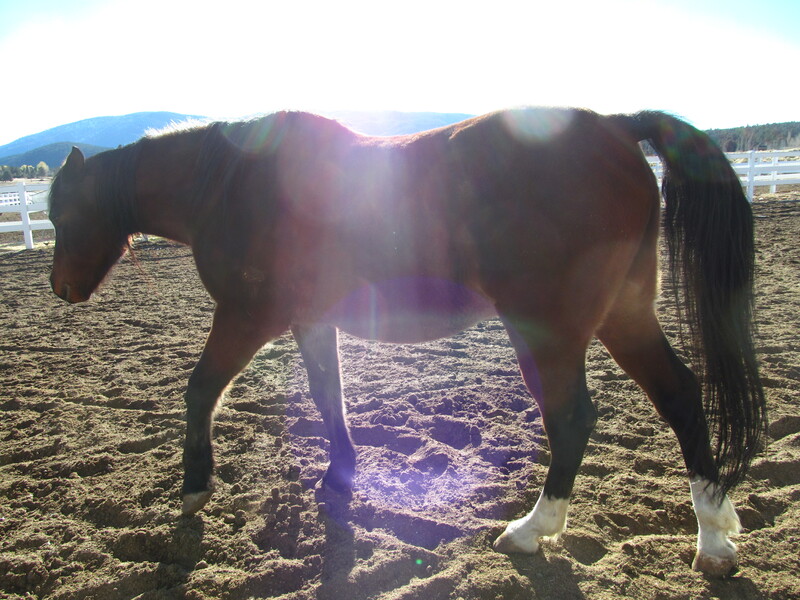 Every good horse has a DREAM HORSE inside – but how do I, as her rider, discover her dream? How do I mine it? Unleash it? Coerce it out of her? 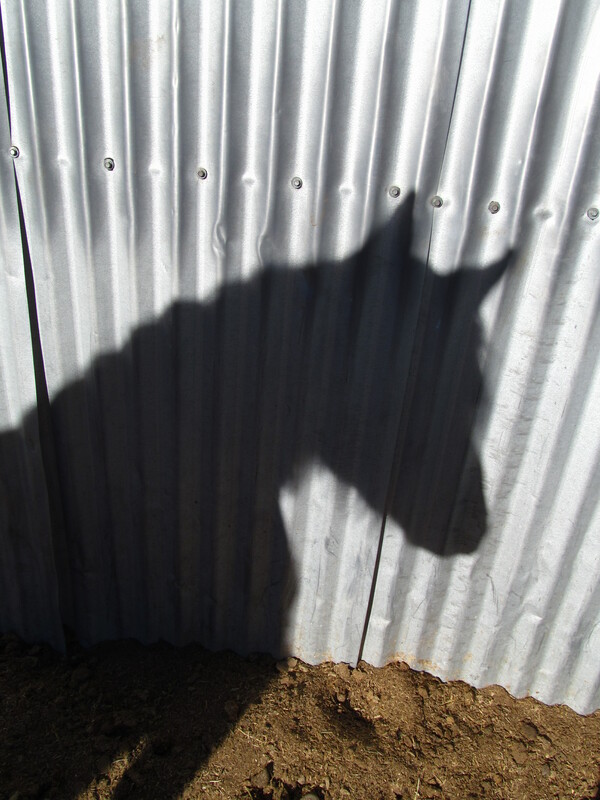 Yes, every good horse has both an indwelling DREAM HORSE and a demon – the instinctive, spooky flight-or-fight creature who resists any attempt at control. 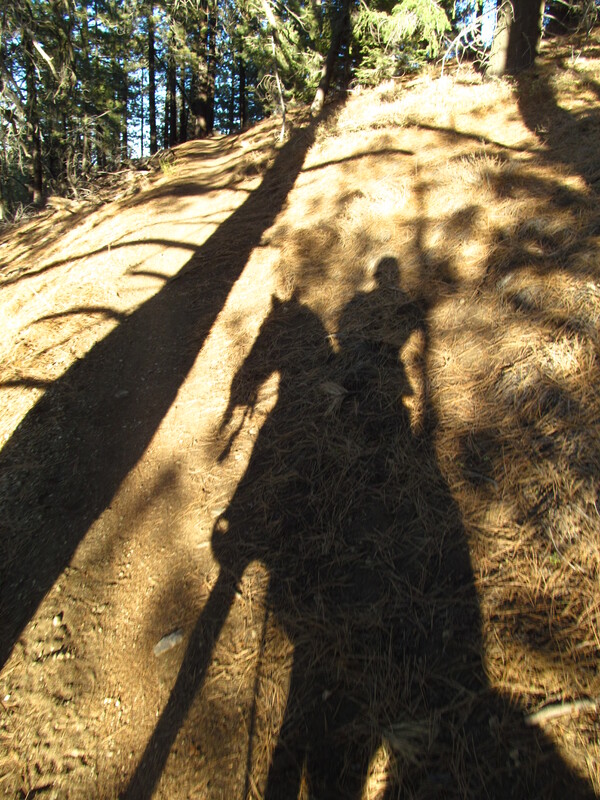 I’m a trail rider, an endurance rider. That means I’m an Arabian rider. And all my horses have varying amounts of Arabian blood. Arabs, as a rule, want to go – and go, and go, and goooooo! That’s why they excel at endurance. They endure because they want to endure. Not because somebody’s pushing them! I don’t like to have to kick a horse, goad a horse to get her to move. I like a horse that wants to move out as much as I do. Fae, being half-Shire, a “heavy” draft breed much like a Clydesdale, tends to be on the lazy side. (She’s only 1/8th Arabian – not that much!) But fortunately she’s not completely dull. She inherited some spice from Fanta, her dam, my tireless Appaloosa/Arabian/Thoroughbred/Racing-Quarter/Endurance-Dream-Horse-Mare. Yet in order for Fae to perk up and move out, she needs something to motivate her. So I notice with Fae that I use certain tricks in order to get her to go. I notice how much I talk to my horses as I ride. Romancing, praising, singing, in an on-going, energetic dialog. I remember years ago observing this while watching a carriage driving competition, how verbal the communication between horse and human. Horses respond well to our speech and tone, so I use my voice to encourage her. Last night I began with camp songs in the meadow area outside the woods (“Just give me land, lots of land under starry skies above, Don’t fence me in…”) then Beatles songs (Norwegian Wood) as we re-entered the forest and came up and into the straight-away, gaining steam. I heard myself repeating over and over (in melodic tone), “That a girl, Fae,” “You’re soo good, Fae,” “What an AWESOME mare!! !” – talking to her constantly in a perky, peppy way, to overcome her heavy-slow-Shire side, and bring-up the Fanta in her. I notice that my riding is very light as far as rein control goes. I’m not “on” her mouth, rather allowing her, encouraging her to move forward. But this isn’t just done with my hands. I bring my energy UP so that she will mimic my behavior. My body rides forward and light in the saddle, encouraging her movement to match mine. Actually, I end up doing far more “surfing” than riding! Like bodysurfing a wave in the ocean, my whole body communicates with my mare. I notice how sensitive she is, and that subtle changes in my muscle tension, incline, and cadence affect her gaits. Riding’s a vigorous physical activity, and I’m often winded by the effort. 1) I find that I incline my body forward, a bit like a jockey, upwards in the stirrups. This places my weight and energy ahead of her center of balance, and acts as a gas pedal to cause her to go. In this manner I either post, lifting out of the saddle with each rhythm of her stride, or I stand somewhat in the stirrups (two-point), leaning forward, letting my legs act as shock absorbers – so that I’m smooth, not bouncing. 2) I use my legs to encourage her on, but not my heels. I “kick” with my upper calves, bump, bump, bumping, in rhythm with her stride. Like a metronome, my active legs set and keep her beat. Another way of thinking of it is like pumping your legs on a swingset. Rhythmical, in, out, in, out… Bump, bump… Pumping her motion in beat with my own. 3) I strive to anticipate what she’ll do. I know where she tends to go faster, slower. At the first feel of her slowing down, I use my tongue against the top of my mouth in a tisk-tisk fashion (rather than a cluck-cluck) to encourage her on, and I do this in unison with the movement of my calves against her, which is in unison with the movement of her stride. All the while, inclining my body forward. 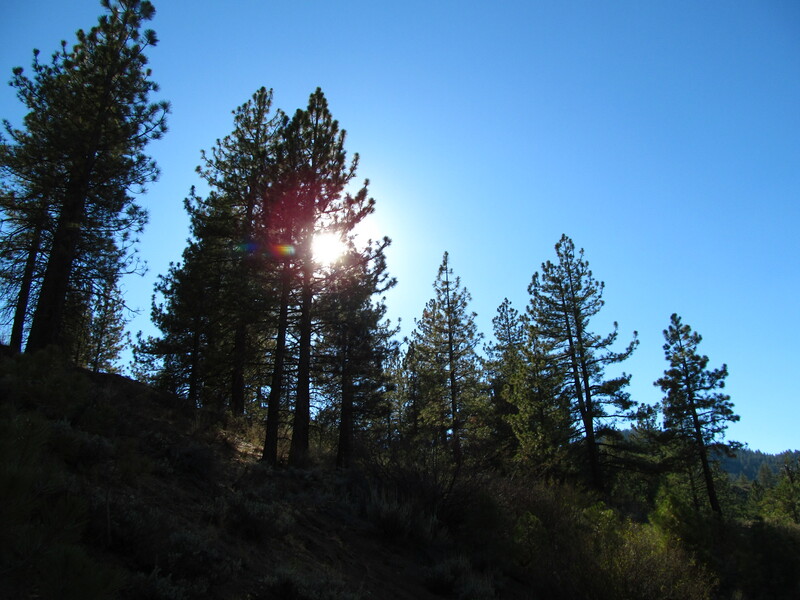 Popping out of the woods, we hit the soft-sand wash, leaping sagebrush and logs, legs flying beneath me. No need to encourage her here, as she grabs the ground and pours on fresh steam with the change of setting and footing. Fae snorts the wind and opens up, Starboy flying behind us. On we soar, rising, dipping, until she finally slows, signaling that she’s had enough. We walk a beat, taking in the beauty of the evening. 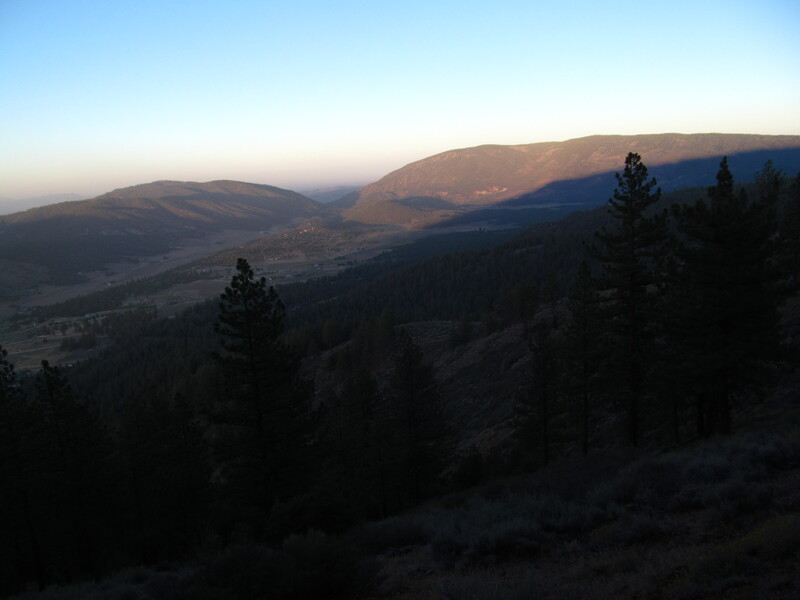 Watching the trees and brush and animal tracks that make up our wild-land home. Her neck stretching, swinging. Out of the wash, at the “galloping place” now – onto the firmer ground of smooth-surfaced dirt roadway, slightly climbing upward – Fae, sufficiently rested, tosses her head and signals that she’s ready to roll. I ease my body forward, no leg needed. She picks up pace now, her smooth stride heaving in a mad-dance of pure-raw-powered horsey joy! Oh the excitement of a warmed-and-ready horse – finally cut loose, galloping full-out – just for the fun! Whoops and hollers! Exuberant hearts! Broad smiles! Starboy bursts into a fresh round of speed. Fae following suit, with quick large strides. Neck to neck. Encouraging one another. Taunting one another. Fae matching, pouring it on… Legs, hooves, blurring, striking the earth. Stretching muscle and tendon and bone. Manes and tails tossing with joy! Looks like I’ve found Fae’s Dream! 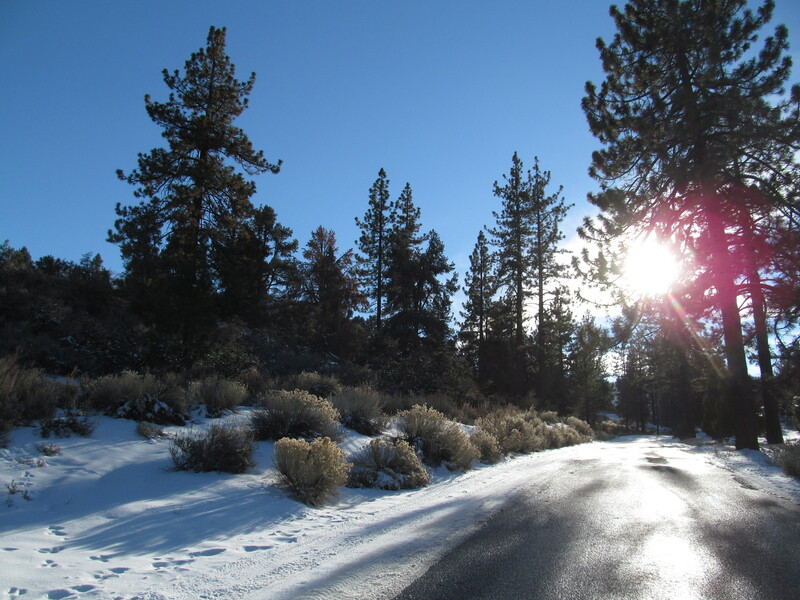 Rode Starboy, ponying Fae, up the Snow Gate Road — until the ice, still unmelted, turned us back. My first ride in six long weeks, due to frozen weather and my routine work and travel. I made mental notes, and I recall them now. Starboy’s movement glides beneath me, ears pricked forward, ready to roll – Fae, following along on a rope off our left side, mirrors our pace. We trot up the long grade to the neck of the hidden dirt road. Burst into a gallop. Then slow due to the slushy patches of ice. At the top of the first hill near the camp, the ice covers the road even thicker, threatening our hooves with slipping and falling. I steer Starboy off to the side, into the low brush and mud, to avoid a blunder. Fae picks her footing on the worst part of the road rut, skidding part-way, but still staying upright – catching herself just in time, like the Scarecrow in the Wizard of Oz. From here the iced-over road gets worse. We can’t go forward, so we turn into the empty camp, shut down for the off-season and the cold. The camp path is damp but free of snow. Walking, we amble past the short row of cabins. Past the mess hall. Past the fire pit. Past the open-air amphitheater, waiting, like a movie set, for next season’s campers to fill the wooden benches that arch around the stage. 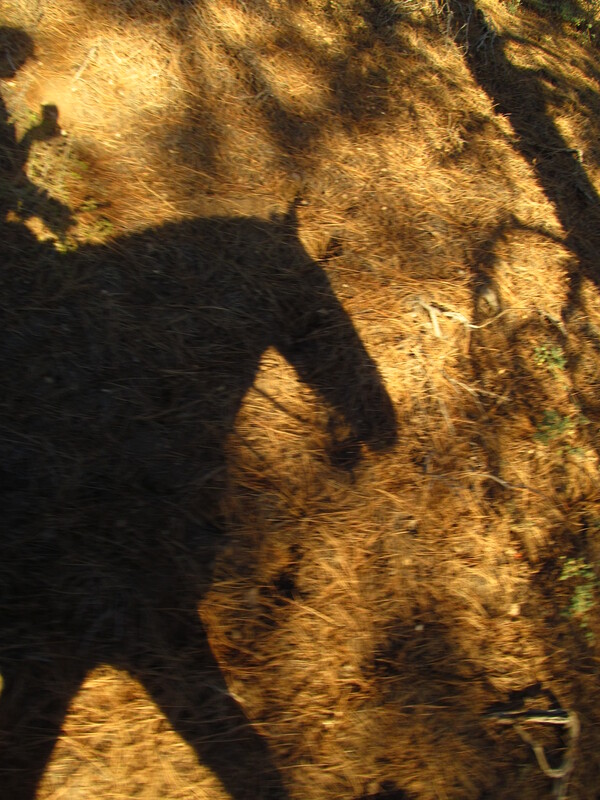 I’ve galloped past the campers before, knowing that at least a few of them must have taken note of our fleeting form, on the other side of the thicket – wishing they, too, could ride. . .
Like me, as a kid, gawking and aaahing over every horse I was lucky enough to see. We turn now and follow a small jeep trail that leads downhill, into the woods. 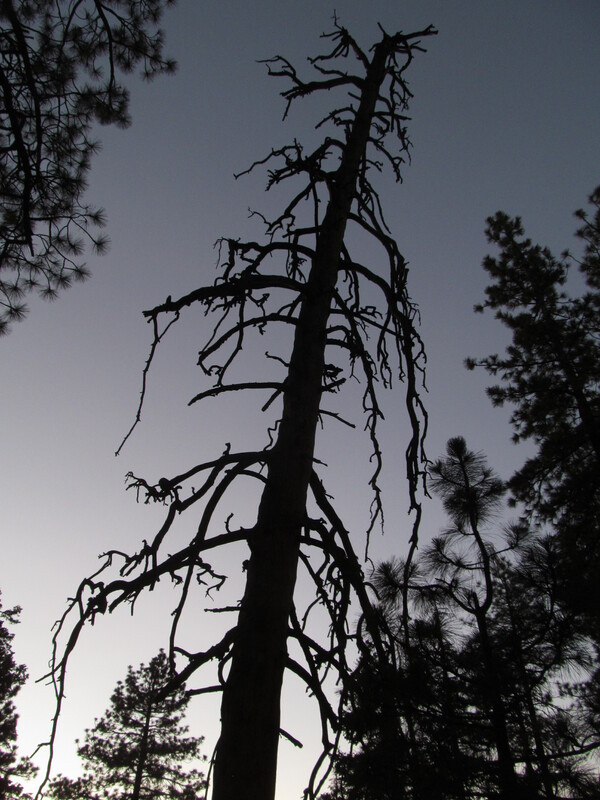 Gazing upwards, native Jeffry Pine trees tower a hundred feet overhead. 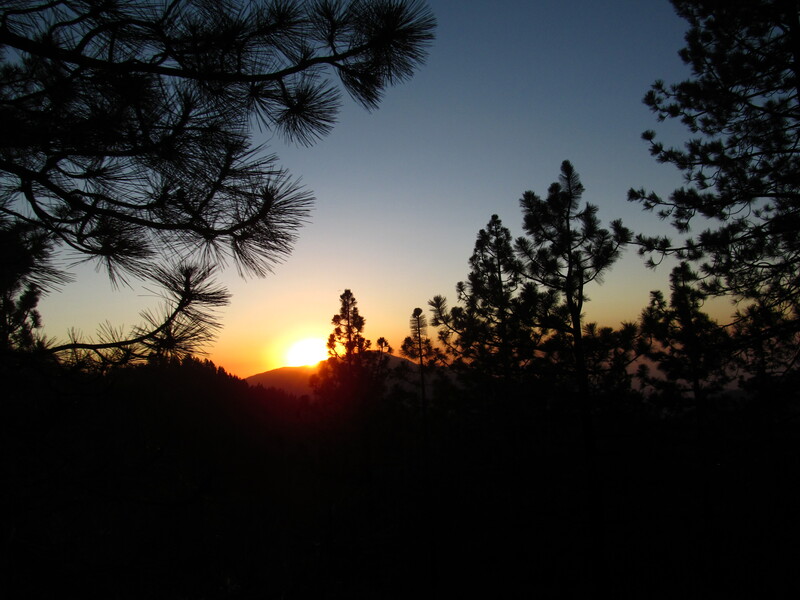 Other than hoofbeats, the sounds of silence surround me – not even a birdcall. How old must this forest be? How tall are these trees? A girl with two horses seems so small, so insignificant compared to all this. I breathe in the smells of the forest. Earthy. COLD. Yes, cold has a smell. Invigorating. Like a walk-in deep-freeze. Looking down, beneath me on the forest floor, short-stemmed grasses hang on to life in the mud, under the snow, waiting-out winter – ready to grow with a moment’s warmth. Pine cones, pine needles, oak leaves dot the earth in Nature’s monotone mosaic. All of life seeming to be on hold right now, in hopes of the signals of spring. My body rocks with the movement of Starboy’s walk. Fluid. Steady. His muffled hoofbeats treading the boggy Earth. Fae’s big Shire feet plodding, reverberating. Her hind feet, shod, scuffing, dragging somewhat, in rhythm with her gait. I feel the air, fresh and cool. Yet in my coat and layers, I’m comfortable – my upper thighs and legs, warm with the friction of fabric in motion, the undersides warm from the woolen fleece saddle cover. The only cold spot, the very-back-sides of my legs, circulating the frigid air with every swaying step. We pop out of the woods now. Back onto the road. Below the ice. Headed home. 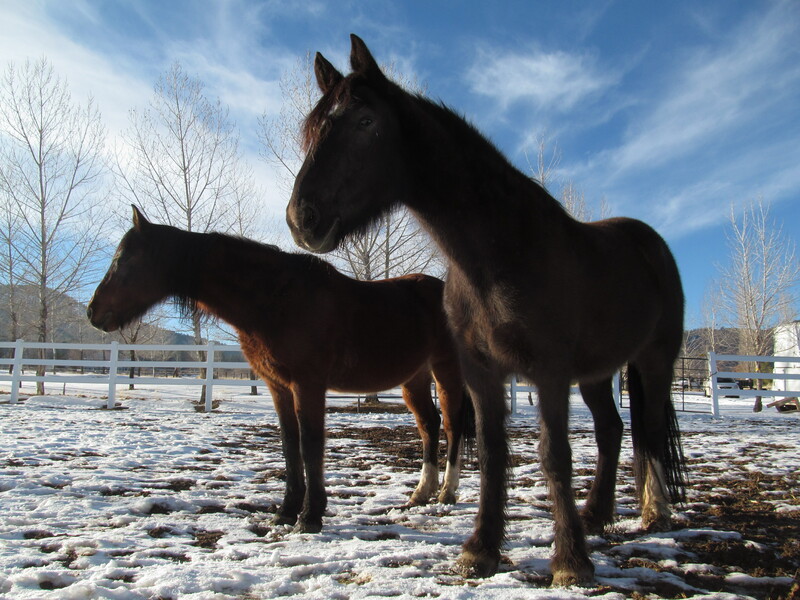 Past our distant-neighbor’s snorting, prancing, head-tossing herd – two pintos, two bays, a chestnut, buckskin? Can’t really tell with the mud and lowering light. Onto the main road now, setting sun behind. Indigo shadows fill the Vee between the ridgelines. Orange-tinted pastels brighten the horizon. Walking home, two dogs, barking, run out in greeting, still inside their fenced enclosure. Trotting again, down the straightaway. Starboy whinnies to his stablemates. And we round the final bend toward home. . .